The Hellenic Republic Asset Development Fund (HRDAF) signed the agreement for the sale of 100% stake in EESSTY (Rosco), the railway maintenance company, to Trainose, the subsidiary of Ferrovie Dello Stato Italiane. The transaction has a value of EUR 22 million. The Sale and Purchase Agreement was signed after the approval by the Court of Auditors and the completion of the transaction is conditional to the competent authorities’ approvals. “This is undoubtedly an important development for Greece and the privatization programme, as it ensures an upgraded role for EESSTY, its further development and that of the wider transport infrastructure of the country. The credit belongs primarily to all those who believed in this project and made it possible for today’s signing. Especially to our people, who implement the Fund’s strategy for the modernization and upgrading of the country’s infrastructure,” CEO of HRADF, Riccardo Lambiris said. 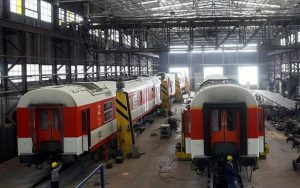 Rosco operates as a company providing maintenance, repair and reconstruction services in respect of rolling stock for railways and other track-based systems. Rosco is currently the sole provider of rolling stock maintenance services in Greece. In October 2016, HRDAF announced that Ferrovie dello Stato Italiane and Škoda Transportation submitted Expression of Interest for the purchase of 100% stake of Rosco. In March 2018, the agency has announced that it has received only one bid for Rosco, from Ferrovie dello Stato.